I'm in my 3rd week of my Coursera course about emerging trends and technologies in the virtual K12 classroom. This week I'm learning more about game based learning and badging in virtual learning environments. Now I've considered badges before as a way of recognizing teacher professional development, but I haven't really been involved in planning for their implementation in recognizing student achievement, so I was interested in the content of these lectures. While open badges are not by any means pervasive in educational systems, they appeal to many educators because they are considered to be more authentic signs of knowledge comprehension and skill acquisition than standard tests, grades or course credits. There are challenges around issuing badges however. Perhaps the most daunting one right now is that the manual creation and distribution of badges can be very time consuming and often needs technical support. Another issue is that there is limited integration with the technologies that most teachers are using - though new ways to do this are emerging. A third issue with badges is that as they are so new they are not yet aligned to or recognized in job application or collage applications (though Google does recognize badges). I will be blogging more about badges in the coming days. 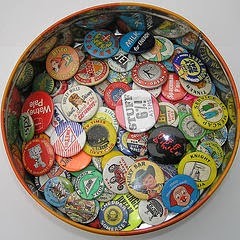 My next post will be considering badges for teachers.